Come early for a snack and a drink at Alamo Drafthouse before the screening of this cautionary tale of corruption, development, and misuse of eminent domain. 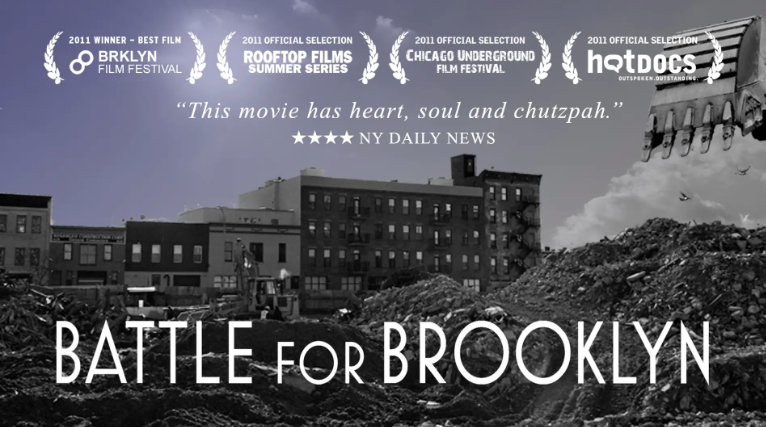 Battle for Brooklyn (2011) follows reluctant activist Daniel Goldstein as he struggles to save his home and community from being demolished to make way for the Atlantic Yards development site: at the time, the densest real estate development in U.S. history. Over the course of seven years, Daniel and his community fight tenaciously in the courts, the streets, and the media to stop the misuse of eminent domain and reveal the deep-seated issues at the heart of the plan. Panelists will include Norman Oder, author of the watchdog blog, Atlantic Yards/Pacific Park Report; Katia Kelly, whose blog, Pardon Me For Asking, chronicles development issues in brownstone Brooklyn; and one of the filmmakers. Tickets for the screening are $5; be sure to RSVP below. Above: Image courtesy of Rumur.